Things I would have changed: way too expensive for what it is - a piece of rod threaded at each end - for FOURTEEN DOLLARS!!!! Things I would have changed: First I would ask for my money back. Then I would suggest that for this kind of money the parts could be made of Cold Rolled Steel or anything. Yes that would add a few more ounces of weight. What others should know: I read so many other great reviews and wonder who wrote them? Things I liked: Part was in stock and delivery was very quick. What others should know: The blocks on my Diana 48 drilled and tapped a little under sized and needed the threads needed to be chased with a bottoming tap. I measured the rod and it is the correct diamiter. Things I liked: Fits like a charm. What others should know: Take your time during the adjustment stage of replacement. Things I liked: Well...not much to say really. It's a threaded rod. It functions as designed. Things I liked: It works. 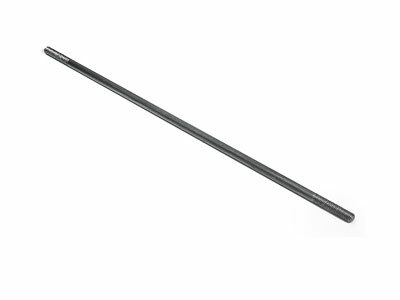 This rod must be this size, diameter, because when adjusted properly, it must flex to hold the cocking handle against the side of the gun, it is the closing device. Things I would have changed: I would have liked some instructions, since I got the gun because the rod was broken, and the owner did not want to mess with it. Other wise, I did manage to figure it out, and now it is working ok.
What others should know: I think anyone that is into serious airgunning can figure out this installation, if not, I know an excellent repair company. Things I liked: Nothing mysterious about installing it. Appeared correct, decent quality. Things I would have changed: I agree with one other person who said a little hint about setting the length would be helpful, but with that heads-up it didn't take long before I figured out the fine tweaking needed. Things I liked: exactly what was needed. What others should know: This is not an OEM replacement. Still works like original. Very quick and easy replacement and easy adjustment. I bought 2 just to have a spare. The only time the cocking rod breaks is when you let someone else shoot your gun that does not know how to release the bear trap. Things I liked: Extremely easy to change out and adjust. Less than 5 minute procedure. could not agree more, measure! Things I liked: Just what I needed prob fixed in 5 min. What others should know: Use rubber sleeve from original rod. Things I liked: This part was the correct part. Easy assembly no hick upps. Things I would have changed: The factory part had a protective sleave rubber or plastic on the rod The replacement one did not. In my opion this is not a factor in funtion. Things I liked: It fits. Things I would have changed: Increased strength to prevent bending. I haven't found a suitable material that resists bending, though stainless steel is close. What others should know: This is an exact fit replacement for when you bend the cocking rod, which is fairly easy to do if you're not careful. It's rather expensive, in that one could purchase 3/16 stainless rod inexpensively and make your own, if you have skill at making your own threads. The thread on this rod is metric, 5X0.8. I suggest using a small metal working lathe for straight threads. Hand-threading is very difficult to do without "weaving" back and forth. In addition, when installing the rod, be very careful of alignment so you don't bend the newly installed rod. The lever must be in the almost-retracted position for proper alignment. The lever should have a very slight resistance for proper lever stowage at the end of the cocking procedure. Things I liked: I bought this to be a spare part. I have heard that this is the one part that brakes and I did not want my hunting trip ruined because my gun was out of action. There is no place locally that I can get this part. They were fast at sending me the parts and it was packed well. Things I liked: It was straight nice finish and non marred threads. Threads screwed nicely without galling or extra force. After spinning in between my fingers I noticed there were no burrs whatsoever. Things I would have changed: Currently it has worked thus far and no bends or breaks. What others should know: The QA/QC on this specific part that I had recieved was wonderful. It took no time to install and adjust. There was no "fitting" in any way, which made it a joy.